Kenny Dreer's history in motorcycles dates back to his early years in Phila, Pa. His father, a pioneer in the import car business during the 50's and 60's era, indoctrinated Kenny to the European cars of the time. Kenny had full knowledge of Hepolite pistons, Girling Brakes, Lucas electrics, and Smith instruments from an early age. His love of British and Italian cars turned to motorcycles in short order. The late 60's and early 70's were the heyday for Brit bikes. hey were some of the biggest and fastest machines on the road, and after owning several smaller Hondas and Yamahas, Kenny moved up to his first Brit bike, a 1968 Triumph TR6R. "I really loved that bike, it just sounded right. I recall my first Norton Commando ride, I was in a parking lot and there was this yellow 750 Norton Commando there. I pulled up with my Triumph, and naturally the owner and I started talking. The next thing I know this guy gives me the keys and lets me take it for a spin. Holy Cow!! This Norton rips!! I couldn't believe the power, it was so much more than my Triumph. I was stunned, and at the same time, I knew right then I had to own one." Photo: Dreer stands aside the 952 Beta model he was developing before R&D on the bike came to a close. Not one to ever leave things as they are, Kenny set about to modify his newly acquired Norton. "I took it apart during the winter, and let's just say I cleaned everything up" and added a few parts from the Paul Dunstall catalog. One late evening returning home from his job across the river in New Jersey, he was leisurely cruising along at 65mph or so, when a Porsche pulled along side. The Porsche dropped a gear and hit it, and Kenny followed suit. "It was all so perfect; I had long gearing on the Norton, and passed the Porsche rather quickly. I could have just relaxed at that point, but the bike felt so good, I tucked in and just continued to click thru the gears. I had a custom speedo I was working on, but it wasn't hooked up at the time. I knew I was going fast, but didn't realize just how fast. I eventually pulled off at my exit off the freeway and was soon stopped by the Pa State Police. The officer had me dismount my bike, and ordered that I get into the back of his car. He then informed me that I passed him at over 120 mph, and that his speedometer was calibrated to 120 and I was pulling away from him. We were both amazed! I was enamored with my Norton and also a 2 year suspended driver's license." The 70's saw a rapid decline in the Brit bike business, so Kenny moved over to working on the Japanese brands. Kenny and his wife Lanie decided to move out west in the early 80's and start life anew. Landing in the Portland area, Kenny promptly got working with what he knew best, motorcycles. "I could always make a dollar with a wrench." After working for several small dealers, he landed a job with Portland Honda, a top 10 national dealership in 1984. During his tenure there, a very sad Norton came in on trade. "Truthfully I had long forgotten British motorcycles." He looked at this bike, with chopper forks, king and queen seat, ape style handlebars, Harley rear wheel, and wondered back to those earlier days with his first Norton. "I asked our Sales Manager how much for the Norton? $100 bucks was the answer. I called my wife, and then I was the owner of my second Norton. He became immersed again in the glory of the mighty Norton brand. "I took it completely down to its last nut and bolt. I had a vision; nickel plated frame, polished cases, deep luster paint, hand pin striping, it was a Snortin' Norton in a time of Japanese motorcycle dominance. That was great bike, an inspirational bike." Later in the 80's the Harley-imposed tariff on Japanese brands took their toll on the industry. "I too became worn out on the motorcycle business." He wanted a new direction and took a suggestion from his wife to study Farrier Science at an OSU extension school in Albany, Oregon. "I became a Horse Shoer and a Blacksmith." He did this for several years, working the area's local barns and for private equestrian owners. At night in his small shop, he continued to dabble in motorcycles, lacing wire wheels and doing motor jobs for local vintage motorcycle enthusiasts. This eventually became "Vintage Rebuilds and Restorations." It became official when he and a friend purchased the inventory of an out-of-business British bike shop in Portland. "Things took off pretty quickly, as I had a good base business going. There was enough inventory that I could actually use to build complete motorcycles." He knew what direction he wanted go with this inventory; not original restorations, but his own custom versions of Triumphs and Nortons. His nickel-framed custom Norton was the direction. He used that bike to launch his new motorcycle business vision. It didn't take long before Kenny's name was in the magazines. His bikes exhibited a level of attention to detail that made their mark. 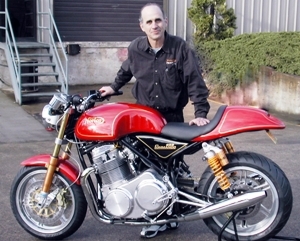 He continually pushed and elevated the "caf� racer" in his designs and further into the engineering of the original bikes. "In a way, this was both a positive and a negative. There is only so much that you can do positively to an older engineering design. I think I pushed past those limitations. Our Robb Report ads were definitely working, along with the magazine articles, we became swamped with work. Vintage Rebuilds was now a business, with employees, deadlines, deliveries, shows, etc. that all businesses deal with. Every article brought a new rush of business; it was getting difficult to stay on top of. I was building bikes for some very wealthy clientele. One of those wealthy clientele was Ollie Curme of Battery Ventures in Boston, Ma. Ollie had business investments here in Oregon, so he was out here frequently. This guy calls me and said he read about my Nortons in a magazine and wanted me to build one for him. Only he had a list of requirements that he wanted. For starters, the bike had to do 150 mph, have great amounts of carbon fiber, and this was only 2 of the huge list of items. He said he was coming out to Oregon, and would stop by and see me." Ollie did indeed come out and visit with Kenny, and they modified the "list" some. Ollie wasn't like the other customers. Ollie wanted to build 50 bikes and sell them. "I told Ollie that this was totally impractical as this was an out of production motorcycle, there were no new parts available. Building one or two at a time, ok, but 50!!!???" Ollie gave him a deposit to build his bike, and then gave him an additional amount to invest in upgrading his business. The next monumental event was the September 1999 cover of Cycle World Mag. Kenny had been twice featured previously in Cycle World. Along with the September issue of Cycle World came a "cease and desist" order from the Aqulini's Investment Group out of Canada, the then current holders of Norton's trademarks. "This is when the proverbial s---t hit the fan". Ollie reassured Kenny that he dealt with those types every day, and to keep at it, and in 5 years we would own the trademarks. Ollie wasn't too far off. Kenny Dreer and Ollie Curme finalized a deal with Joe Seifert in Germany and in January of 2003, Norton Motorsports became the sole Norton global trademark owner. Photo: Portland area racer, Patrick Leyschock takes the 952 for a spin during the Cycle World photo shoot. They both thought that in owning the rights to one of the most iconic British Motorcycle brands, investors would be lining up at the door. There was trouble brewing though. Kenny's vision of Norton with the VR880 was like a double-edged sword; on the one hand the bike was beautiful and powerful, but on the other it was still at its core an old vintage bike. "I had dealers calling us up and wanting to buy 10 bikes!" These bikes could not pass EPA/DOT regulations, therefore the dealers would have to pay cash, and could not use their floor financing to purchase them. "I knew the VR880 was a successful model, but it had to be a new bike. I spoke with Ollie in this regard, that it was my intent to recreate the VR880 on a new bike platform; that did not bode well with Ollie." Ollie Curme didn't agree, and the next year for Kenny was devoid of any money. "Ollie nixed me for close to a year, I had to lay off my employees, and came very close to shutting down the operation. I basically hung in there myself, doing what I could with the barest of capital." These were dark days. "Ollie called in early August of '02, surprised that I answered the phone. He said that he would be in Portland, and he wanted to meet with me." During this low tide, Kenny kept at it, researching new methods of Rapid Model Prototyping, especially castings, as this was the foundation of any new engine model. As Kenny explains, "Ollie and I went to dinner at a restaurant in Portland's International Airport. We discussed much, and I finally got him to believe in a next generation Norton. Some funds finally found their way back into the bank, and business operations started to roll forward again. Ollie had one precondition. I had to hire a fully qualified CEO to raise the funds necessary to continue. "To be honest, I've hired mechanics, service writers, warranty clerks, but never a CEO!" "I figured if I have to hire a motorcycle CEO, the best place to start would be another motorcycle company." Kenny was making considerable progress with the new 952 prototype and all the CEO candidates who came in were awed that this small company (?) could accomplish such a feat. "You should have seen their faces; this wasn't by any means a state-of-the-art design facility. I was working with some very talented people. We had believers." The first prototype lit off in January '03 at 6 a.m. in the morning. "I'll never forget that moment, all this anticipatory anxiety, gasoline bottles, oil feed and oil return bottles, battery and cables running to the bike and back, it looked more like a medical emergency room than a motorcycle shop. Brett Hoyt, Floyd Holschu and I were there, I hit the button and vroom! It started like it was no big deal, unbelievable. We're watching all the clear oil lines, and it's all working, oil in, oil out, it's a runner." Later that same day, the prototype Norton ventured onto the roadways of Portland. "This bike was awesome, it had power like no other Norton I ever rode." This was the beginning of a very long and tortuous road to production. "Designing and building a motorcycle from the ground up is not for the faint of heart, or light in the pocketbook. This is a long, hard and expensive slog." "I knew Ollie was getting to the end of his financial rope earlier. From the beginning he told me his wife was scolding him over his involvement in this deal. At the same time we were having difficulties raising any significant funding outside of Ollie." Ollie and the trademark attorneys, (Dreer calls them rodents) were pushing to have a bike ready for production in a sense to "commercialize" the trademarks. "The business types and the engineering types live in two entirely different spheres. I've seen this in all my years working within a dealer environment, it's like a war between the sales department, who will say anything to make a sale, and the service department that have to repair, and make good for all the promises that the sales guys make!" Kenny Dreer has just graduated from the Mendenhall School of Auctioneering. His long term goal is to establish 'Kenny Dreer Classic Motorcycle Auctions'. He is active in the North West Drag Bike Association and will compete with his Pro Mod Suzuki this year. He wants to best 7.50 in the � mile and some say he's probably going to do it.